Augee, M. L., ed. 1992. Platypus and Echidnas. Royal Zoological Society of New South Wales. Augee, M. L. and B. Gooden. 1993. 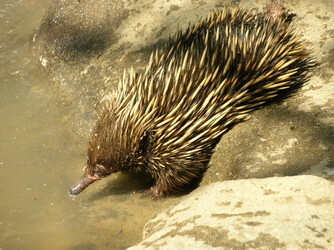 Echidnas of Australia and New Guinea. Australian Natural History Series, NSW University Press. Flannery, T. F. and C. P. Groves. 1998. A revision of the genus Zaglossus (Monotremata, Tachyglossidae), with description of new species and subspecies. Mammalia 62:367-396. Griffiths, M. 1999. Monotremes. Pages 295–302 in Encyclopedia of Reproduction, vol. 3. J.D. Neill, ed. Academic Press, San Diego. Griffiths, M., R. T. Wells, and D. J. Barrie. 1991. Observations on the skulls of fossil and extant echidnas (Monotremata: Tachyglossidae). Australian Mammalogy 14:87-101. Lee, M. H., R. Shroff, S. J. B. Cooper, and R. Hope. 1999. Evolution and molecular characterization of a beta-globin gene from the Australian echidna Tachyglossus aculeatus (Monotremata). Molecular Phylogenetics and Evolution 12:205-214. Musser, A. M. 2003. Review of the monotreme fossil record and comparison of palaeontological and molecular data. Comparative Biochemistry and Physiology A. Molecular and Integreative Physiology 136(4):927-942. Retief, J. D., R. J. Winkfein, and G. H. Dixon. 1993. Evolution of the monotremes - the sequences of the protamine p1 genes of platypus and echidna. European Journal of Biochemistry 218:457-461. The Enigma of the Echidna. National Wildlife Federation. Echidna Love Trains. Australian Broadcasting Corporation. Short-Beaked Echidna, Tachyglossus aculeatus. Parks & Wildlife Service Tasmania. Page: Tree of Life Tachyglossidae. Echidnas. The TEXT of this page is licensed under the Creative Commons Attribution-NonCommercial License - Version 3.0. Note that images and other media featured on this page are each governed by their own license, and they may or may not be available for reuse. Click on an image or a media link to access the media data window, which provides the relevant licensing information. For the general terms and conditions of ToL material reuse and redistribution, please see the Tree of Life Copyright Policies.